I am not impressed with the slow response of SFPD and the irresponsibility from the city government on the handling of Upper Great Highway. Loyal readers of my blog knows I write about Upper Great Highway and when the stretch of roads closes due to flooding or too much sand on the road. When the city government or the police closes a road, they are responsible for switching the signals at Lincoln (Southbound closure) and/or Sloat (Northbound closure) to four-way stop. When the city FAILS to do it, I call 311, DPT signals, or SFPD dispatch to warn them the signals are operating normally (red-yellow-green cycle). 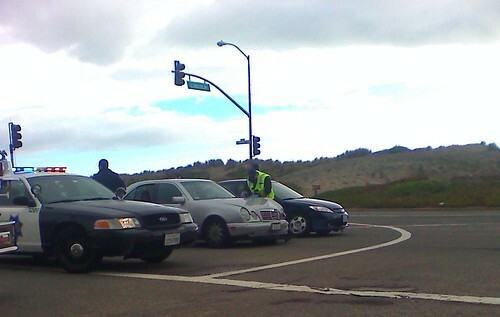 Read this story to understand why failing to switch the signals to 4-way stop can be a problem. Southbound Upper Great Highway was closed today at Lincoln due to the rains from last night. How do I know it was closed today? I drove northbound at about 11:15PM last night after the Giants game, and southbound traffic was flowing normally. At 3PM, I drove my car along Great Highway to enter the "Upper" stretch at Lincoln, but I noticed the metal barricades indicating a closure, and the signals was not operating on 4-way stop. I had no choice but to turn left and drive along the "Lower" Great Highway, which is the alternate parallel street when the road was closed. 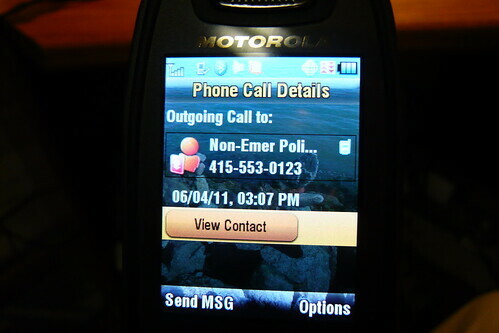 I pulled my car over and called SFPD at 3:07PM (see proof below). I told the dispatcher about the road closure and the signals not switched to 4-way stop. I also told the dispatcher that there is a very high chance a car may collide with another vehicle because some drivers turn left on the red arrow, and risks getting t-boned with northbound traffic. I also warned the dispatcher that without the 4-way stop, four lanes of traffic southbound must turn left into just two open lanes; local residents know that when there's a 4-way stop at the intersection, all drivers merge into the left turn lanes and follows the 4-way stop rules. I WARNED SFPD two hours ago about the potential risk of an accident where two cars will collide due to the road closure of SB Upper Great Highway at Lincoln AND the failure to switch the signals to 4-way red. There is blame to share, one of the two drivers did not follow the signal or someone ran the red light. Also, SFPD, DPT signals, and any other city agency is to blame for FAILURE to switch the signals to four-way red/stop. I have called 311, DPT, and SFPD dispatch numerous times throughout the years of the failure to switch the signals when the road is closed. Sometimes they do it, many times NO. This is a WARNING to the city government, DO YOUR JOBS and make sure to switch the signals to 4-way stop whenever you shut-down Upper Great Highway at the cross-street of Lincoln. Someone could have been KILLED or seriously injured if the accident was much worse. UPDATE: Someone fixed the signal to 4-way stop sometime after the accident. I noticed it from the top of a hill at about 9PM.